WARDROBE MALFUNCTION: WHEN FOOTBALL KITS GO WRONG! 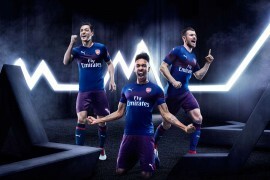 Football kit should be easy; a bunch of grown men, professionals at the top of their field, show up and put on the same clothes as everyone else in the changing room. But something has been in the air in 2011, as we’ve seen a swathe of shirty gaffes – now, we’re rounding up some of our favourites to share with you! Spanish striker Fernando Llorente perplexed football fans everywhere earlier this year as he took to the pitch for a Euro 2012 qualifier against Lithuania in an old version of the Spain home kit. No explanation was ever given for the striker’s decision to wear the outdated jersey – but we have to give Fernando some sympathy; Spain have had 3 new home kits in the last 18 months – we wouldn’t know which one was the right one to wear either. Messi, Soggy and Not at All Handsome. 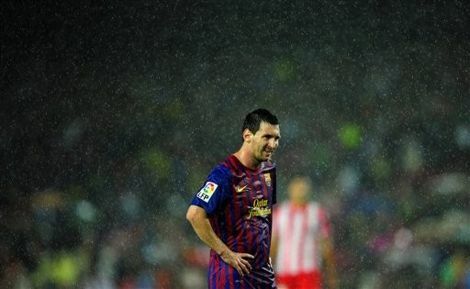 Barcelona found themselves with an unconventional kit problem at the start of the 2011-12 season, as Catalonia was drenched by unexpected rainstorms. The Camp Nou club filed a complaint with kit supplier Nike saying that their shirts wereabsorbing too much water during play, and slowing their players down! Balotelli Gets Shirty with Italy. Mario Balotelli is one of football’s biggest characters, and even the most ardent of opposition fans seem to have to something of a soft spot for the Italian striker. However, one thing even Super Mario couldn’t get away with was wearing Italy’s old Home kit on the debut of their new one. After starting the game in Puma’s latest creation for the Azzurri, Balotelli emerged for half time in a friendly against Uruguay wearing the Italy kit from the World Cup in 2008. 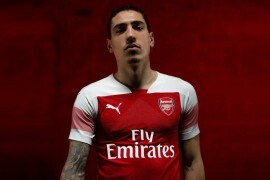 It didn’t take long for the big forward’s cheeky kit-switch to be noticed, and was given his new shirt to finish the game in. We can image that Puma were probably not amused. Experienced Ireland International Richard Dunne might well believe that he’d seen everything the beautiful game had to throw at him, until a collision during qualifier in Russia left the Dunne bleeding on his kit and in need of a new shirt. 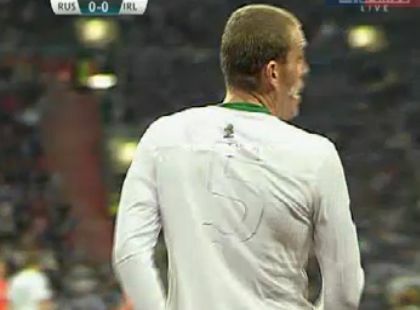 With no spare printed shirts apparently in the kitbag, the Republic of Ireland’s goalkeeping coach had to draw a number 5 onto the back of Dunne’s shirt with a felt-tip pen. Tailored by Umbro and made bespoke by Sharpie. The Eagle Has (Not) Landed! Polish football fans were left spitting feathers after their FA instructed kit manufacturers Nike to leave off the iconic White Eagle that graces every National Team’s uniform. After boo’s and chants of ‘Bring Back the Eagle!’ marred their first two friendlies in the new kit, Polish officials apologised to the fans for trying to ‘modernise’ the new kit too much, and instructed Nike to revise the design of the Euro 2012 host nation’s jersey to include the legendary bird of prey. and Finally… Nike’s Number is up for England Rugby. Switching sports, Nike were left slightly embarrassed during the Rugby World Cup as England’s numbers began to peel off their shirts during the first game of their ultimately embarrassing campaign. England’s egg-chasers took on Argentina in their opening group game, and soon found the printing on their shirts was flaking off during play. 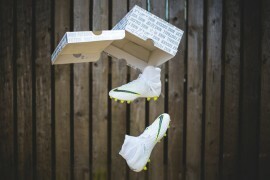 Thankfully, Nike were able to fix this problem by the next game – but for the time England were in the tournament' afterwards, they might as well not have bothered! Next articleMIZUNO TEASE NEW MORELIA NEO COLOURWAY? Made me laugh. Nike is losing quality over the years. I mean no disrespect, cause I love footyboots, but you guys need to proofread your articles before you post them up.